1 Let’s begin by first frying the potato and carrots in hot oil until lightly browned. Remove from oil and transfer on a plate lined with paper towels. Set aside. 2 In the same pan, throw in the garlic and onions. 3 Add the pork kasim and liempo next and fry until slightly brown in color before adding the liver. Cook for 2 minutes. 4 Drop in the Knorr Pork Broth Cubes and give this a nice stir to dissolve completely before adding the tomato sauce, water, sugar and black pepper. Mix this well. 5 Now, gently place the fried potatoes and carrots in the pan. Continue to cook over low heat until meat and potatoes are cooked through and the sauce has thickened. 6 Finally, add raisins and bell peppers and just allow to cook for 2 minutes longer. Here’s a dish that will bring the entire family together. 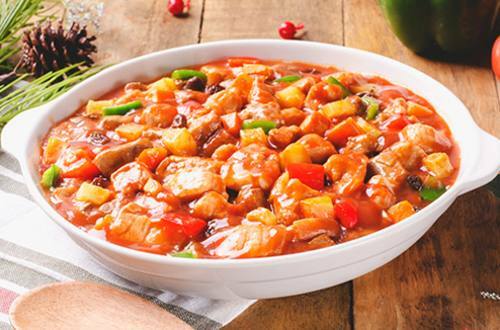 Pork Menudo, just like home, is always close to your heart.